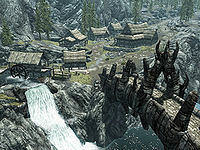 Dragon Bridge is a small town built near the ancient iconic Dragon Bridge in northwestern Skyrim near Solitude. The bridge and town are of vital interest to both the Stormcloak rebels and the Imperials in the civil war. The townspeople of Dragon Bridge are worried that either side may seek to destroy the bridge as a means of preventing the other from crossing. There are two families that live in Dragon Bridge: Horgeir and Olda, and the Lylvieve family. The guards have been harassing the Lylvieve family and Faida, the proprietor of the inn by refusing to pay, stealing, and attempting to "have their way" with Julienne Lylvieve. The mill, however, has prospered due to the increased demand for lumber. The town consists of a main road running northeast from the bridge toward Solitude. Dragon Bridge lumber camp and sawmill are the first buildings to the left of the road after crossing the bridge into Dragon Bridge. The mill is powered by the Karth river, which flows beneath the bridge on its way to the Sea of Ghosts. Next to the lumber camp is the only outpost for the Penitus Oculatus, who replaced the Blades as the personal security and espionage force for the Emperor when the Blades disbanded. Northeast of the outpost is Horgeir's house, home to Horgeir, his wife, and his brother Lodvar. Opposite his house is the town's inn, the Four Shields Tavern, which is the only building on the eastern side of the main road. Behind the inn is a secondary road that starts near the bridge and circles the inn before rejoining the main road at the other end of town. Next door to Horgeir's house is the Lylvieve family's house, where Azzada Lylvieve lives with his wife and two children. † May be killed in the Dark Brotherhood quest, Hail Sithis! Prophet (Dawnguard): Find and rescue a Moth Priest from the vampires. Prophet (Vampire): The time of prophecy has arrived! Locate a Moth Priest for the vampires. Olda Horgeir's House Dragon's Breath Mead: Retrieve the Dragon's Breath Mead and give it to either Olda or Horgeir. The treasure of Treasure Map VIII is located underwater near the bridge. A satchel containing its key can be found a few paces upstream of the bridge. There is a gold ore vein upstream from the bridge on the bank opposite from the town. There is also an iron ore vein upstream from the bridge, on the right, next to a nirnroot. A stone quarryHF is located behind the lumber camp, at the foot of the cliff wall. This page was last modified on 8 June 2015, at 16:23.